General microbial biofilms are defined as communities of microbes associated with any surface (Costerton et al., 1994). In dentistry the surface can be any tooth tissue (enamel, dentin), dental material or any other surface located in the oral cavity. This microbial complex system, also known as 'dental plaque" is organized as bacterial biofilm community that consists of more than 700 different bacterial species (Aas et al., 2005). It is also important to point out that the diverse community of microorganisms found on the tooth surface as a biofilm is embedded in extracellular matrix of polymers (Marsh, 2004). Bacterial species are thought to play important role in the maintenance of oral health and in the etiology of oral diseases in humans (Socransky et al., 2002). Oral biofilms develop naturally and the resident plaque microflora contributes to the host defenses by preventing colonization by exogenous species (Marsh, 2003). Mechanisms contributing to colonization resistance include more effective competition for nutrients and attachment sites, production of inhibitory factors and creation of unfavorable growth conditions by the resident microflora (Marsh, 2004). The composition of oral biofilms varies on distinct anatomical surfaces due to the prevailing physical and biological properties of each site (Bowden et al., 1975; Theilade et al., 1982). An important factor involved in oral biofilm formation is the need for specific intermolecular interactions between bacteria and receptors to occur selectively on the enamel surface. In addition to intermolecular interactions, initial attachment of bacteria on a surface is also mediated by nutrient availability, hydrophobicity and hydrophilicity between cell surface and substratum, proteins specificity (Marsh and Bradshaw, 1995). Between routine oral hygiene procedures, communities re-form on enamel by sequentially adding bacterial constituents in a predictable manner. All bacteria exhibit the ability to adhere to at least one other species of oral bacteria and usually to multiple species. An inherent characteristic of many species of oral bacteria is their ability to recognize and attach to genetically distinct bacterial cells. This phenomenon is termed co-aggregation and has been linked to biofilm formation and maturation of dental plaque (Kolenbrander & Palmer, 2004). Microbial co-aggregation is also thought to be a universal trait of all biofilm bacteria (Rickard et al., 2003) enabling rapid colonization of surfaces and protection from external conditions contributing to survivability, particularly from antimicrobials (Filoche et al., 2004). The spatial distribution of bacteria is affect by microbial metabolism which produces gradients in biologically significant factors. Gradients develop in key parameters that affect microbial growth (nutrients, pH, O2, etc.). This will lead to vertical and horizontal stratification of the biofilm plaque and produce a mosaic of micro-environments (Marsh, 2000). These gradients are not linear and such heterogeneity may explain how organisms with apparently contradictory requirements (e.g. in terms of atmosphere, nutrition) are able o co-exist in plaque, and how they are able to influence the activity of antimicrobial agents at different locations within the biofilm (Marsh, 2003). Adsorption of host and bacterial molecules to the tooth surface to form of a conditioning film (acquired pellicle). 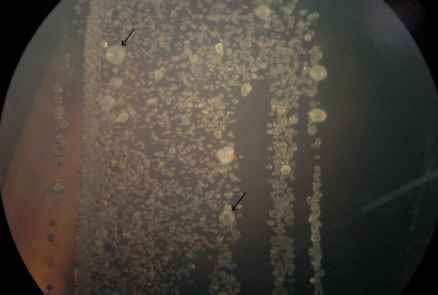 Pellicle forms immediately following eruption or cleaning (Al-Hashimi and Levine, 1989) and directly influences the pattern of initial microbial colonization (Marsh, 2004). Passive transport of oral bacteria to the pellicle-coated tooth surface. A non-specific reversible phase involving physic-chemical interactions among salivary bacteria and acquire enamel pellicle creates a weak area of net attraction facilitating reversible adhesion. Subsequently, strong, short-range interactions between specific molecules on the bacterial cell surface (adhesins) and complementary receptors in the pellicle can result in irreversible attachment (Lamont & Jenkinson, 2000) and can explain microbial tropisms towards surfaces. Many oral bacteria possess more than one type of adhesion on their cell surface. Co-aggregation (co-adhesion) of later colonizers to already attached early colonizers. This co-aggregation that also involves specific interbacterial adhesion-receptor interactions (often involving lectins) leads to increased biofilm diversity (Kolenbrander et al., 2000). Co-adhesion may also facilitate the functional organization of dental plaque (Bradshaw et al., 1998). Multiplication of attached microorganisms to produce confluent growth: Cell division leads to confluent growth and eventually, a three-dimensional spatially and functionally organized mixed-culture biofilm. Dental plaque functions as a true microbial community in which properties are greater than the sum of the component species (Marsh, 2004). Active bacteria detachment from surfaces: Bacteria can respond to environmental cues and detach from surfaces, enabling cells to colonize elsewhere. It has been suggested that oral biofilm formation consisted of two process involving separate mechanisms (Gibbons and van Houte, 1973). The first process was associated with adsorption of cells to the pellicle and required specific adhesions on the cell surface. The second step involved a build-up of cells biding to each other in a process termed co-adhesion. Bacterial accretion through co-adhesion drives the temporal development of plaque biofilms that is characterized by bacterial successions and occurs over a time frame of weeks. The early biofilm consisted of pioneer organisms deposition followed by multiplication in morphologically distinct palisading columns of cocci (Rosan and Lamont, 2000). Pioneer species are predominantly streptococci (S. sanguis, S. oralis and S. mitis) (Marsh and Bradshaw, 1995). Although the oral streptococci initially predominate in plaque and can constitute up to 80% of early plaque, another significant colonizing species is Actinomyces naeslundii, and some haemophili (Rosan and Lamont, 2000). Single cells of mainly Gram-positive coccoid cells can be seen by microscopy on pellicle-coated surfaces, together with a few rod-shaped organisms, after few hours (2-4h) of plaque formation (Marsh and Bradshaw, 1995). The attached cells then divide rapidly to form microcolonies in the first instance, which coalesce to form a confluent film of varying thickness (Nyvad and Fejerskov, 1989). After 1-2 days, Gram-positive rods and filaments can be observed extending outwards from microcolonies of mainly coccoid cells. After several days of development, morphological and cultural microflora diversity increases. The biofilm depth increases and its structure becomes more varied. 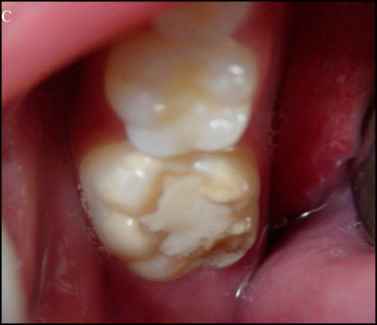 If plaque is left to develop undisturbed on exposed enamel surfaces for 2-3 weeks, a climax community will establish and bacterial composition will become relatively constant overtime (Marsh and Bradshaw, 1995). A very important key point on biofilm formation is the synthesis of extracellular polyssacharides from sucrose by adherent bacteria (Figure 1). These insoluble molecules are considered very important contributors in the structural integrity and pathogenic properties of biofilms. Confocal laser scanning microscopy techniques has demonstrated that "dental plaque" has a similar architecture to biofilms from others sites. Dental plaque has open architecture, with channels traversing from the biofilm surface through to the enamel (Wood et al., 2000; Zaura-Arite et al., 2001). This structure will have important implications for penetration and distribution of molecules within plaque. One of the most notable features of clinical relevance with respect to phenotype of microorganisms growing on a surface is the increased resistance of biofilms to antimicrobial agents (Mah and O'Toole, 2001). Bacteria growing as a biofilm frequently express phenotypes that are different from those of planctonic bacteria and one possible consequence can be a reduced sensitivity to inhibitors. Most pre-clinical trials for testing oral antibacterial products used planctonic techniques where cells grow freely without any effect of biofilm structure. Therefore, most products that showed good in vitro results did not show similar effects under clinical evaluations (Guggenheim et al., 2004; Leibovitz et al., 2003; Marsh, 2004). The observation that genetic expressions of S. mutans are not the same for planctonic and biofilm forms of organization supports that most antimicrobials need biofilm techniques for reproducing more closely to the oral environment in vivo (Marsh, 2004). A greater understanding of the significance of oral biofilms as a complex bacterial structure will have the potential to impact significantly on clinical practice (Marsh, 2004). Biofilms in nature are often difficult to investigate and experimental conditions are not completely defined. Therefore, a number of different laboratory-based experimental biofilm model systems have been developed (Palmer, 1999). These systems allow studies on biofilms under defined conditions. Such systems are necessary in order to perform well-controlled reproducible experiments (Tolker-Nielsen et al., 2000). Various multispecies models of biofilm testing procedures have been described and applied to problems of clinical relevance, most notably biofilm permeability and chemical control. These systems usually consist either of flow cells (Christersson et al., 1987; Larsen and Fiehn, 1995) or chemostats modified to allow for insertion and removal of colonizable surfaces (Bowden, 1999; Bradshaw et al., 1996; Herles et al., 1994), and these devices have contributed to our understanding of microbial adhesion and biofilm formation. In spite of the great development on oral biofilms studies, there is still a room for improvement. Thus, new insights will be presented in the near future on this topic.